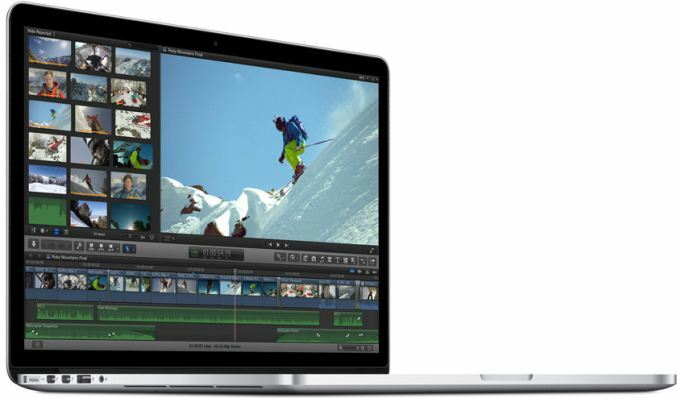 Earlier this week Apple announced their 2015 15” Retina MacBook Pro. Though Apple didn’t make any CPU changes, they did make some GPU changes on the high-end model, swapping out NVIDIA’s GeForce GT 750M for AMD’s Radeon R9 M370X. Since the M370X was not a published part number in AMD’s recently-announced 2015 Radeon M300 series refresh lineup, there have been some questions over just what M370X really is. 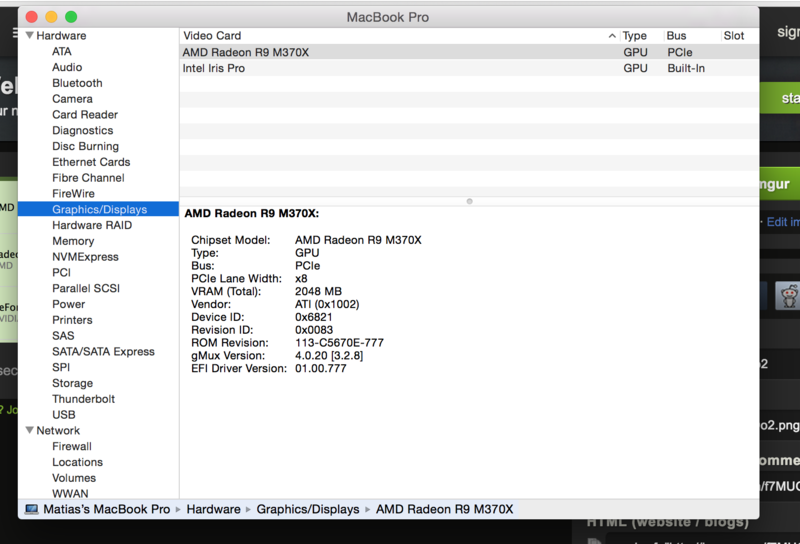 At the time of the rMBP’s launch, we suspected that it was an AMD Cape Verde GPU, based on the fact that this GPU is also in the M375, which is the next part above M370X. With the new laptop shipping immediately, M370X models have already begun arriving in buyers’ hands, finally giving us a chance to confirm the GPU inside. 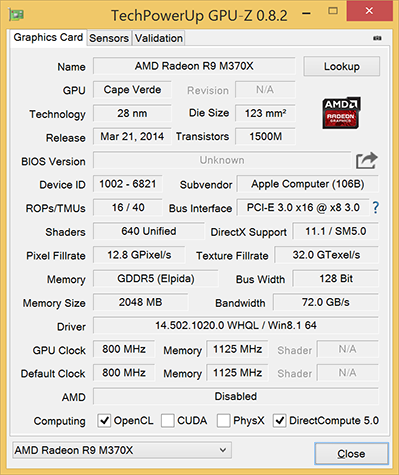 Thanks to Reddit user ootan, who posted a screenshot of the rMBP’s System Profiler, we can now confirm that the GPU in the rMBP is in fact AMD’s Cape Verde GPU. 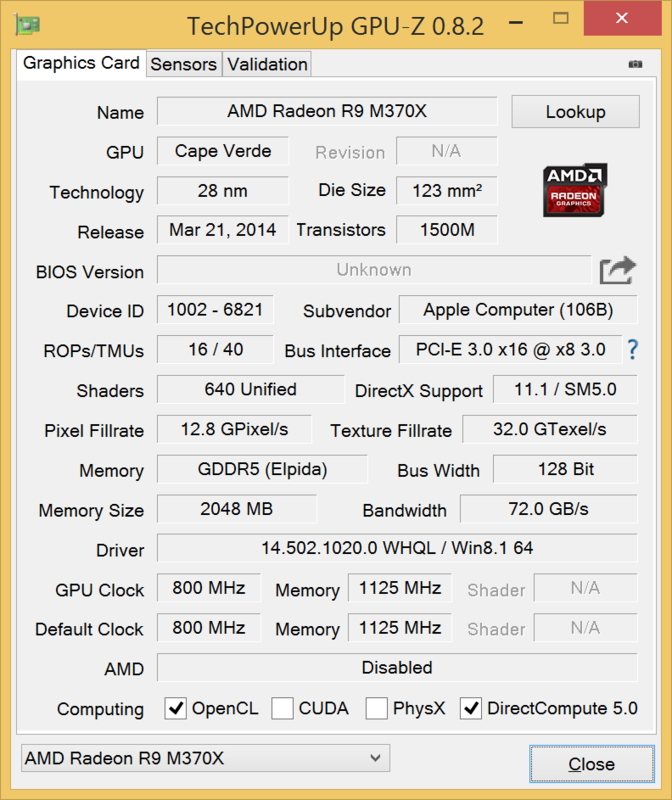 AMD has previously used the 6821 device ID on other mobile Cape Verde parts, so 6821 is already a known quantity. As for Cape Verde itself, as our regular readers may already know, it’s one of AMD’s first-generation GCN 1.0 GPUs, launched back in 2012. Compared to the GK107 GPU found in the GT 750M, it is a larger, more powerful (and at least in the desktop, more power-hungry) GPU, designed for more powerful devices than GK107 was. As for why Apple opted to switch now and to this GPU, we’ll leave that to Apple, AMD, and NVIDIA, though it’s by no means surprising that after having run GK107 for a couple of years, they would want to upgrade to a more powerful GPU. Meanwhile, though we don’t have M370X on-hand at the moment, at least in the desktop, where GPU performance is unrestricted by thermals, Cape Verde fares very well. The rMBP on the other hand does have thermal constraints to deal with, so performance won’t be the same, but I expect it to fare reasonably well as well. Though at the same time I’m also curious if the use of a higher performance part has impacted the rMBP’s battery life when the dGPU is active; AMD and NVIDIA both do heavy binning, so a simple extrapolation won’t work here. Update: And no sooner do I post this then someone sends me a screenshot of GPU-Z from a 15" rMBP running Boot Camp. GPU-Z, for those unfamiliar with it, uses register poking to identify GPUs, so if the device ID wasn't enough, this settles it. This also confirms the clockspeeds - 800MHz core, 4.5GHz VRAM - and that the M370X is using GDDR5, unlike it's M375 counterpart. Thank you DMDrew812. 2. 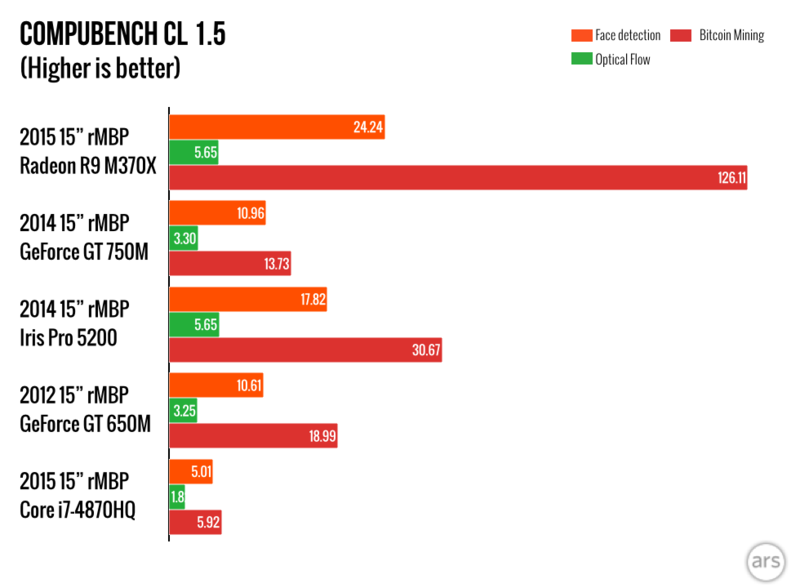 THINK OPENCL 2.0: AMD's GPUs simply do OpenCL computes better than nVidia's GPUs ON MACBOOK PROS RUNNING OS X.